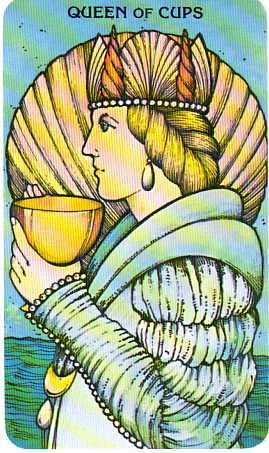 Court Cards can perform a specific function within a Tarot reading; the role of Significator. A Significator is a card that is deliberately chosen to represent the sitter. There many different ways to select a Significator, so I’ve decided to break down the various methods of selection into next week’s blog postings. Note that I say ‘CAN’ have a specific function: Not everyone bothers with a Significator card these days. Regardless of your method of choice, if you deliberately select a card to act as the sitter, then you immediately preclude that card from turning up within the reading itself. That grates on the sensibilities of many Tarotists who would prefer to have ALL the cards at their disposal. It’s a perfectly valid reason not to bother with a Significator, but it’s simple to get round that particular bugbear – just use a different set of Court Cards to those in the deck you are working with. This will ensure you have ALL court cards at your disposal for the reading itself – as well as allowing you to work with your favourite courts. It could even give new purpose to a damaged deck that is currently lying unused and unloved in a drawer – use the courts solely for significator selection? It’s an idea, what do you think? There are some fantastic spreads that depend upon the use of a Significator, namely the Golden Dawn’s Opening Of The Key spread, which we will look at in a subsequent blog posting too. Jeez, we’re going to be busy! I’ve found that using a Court Card as a significator really helps me get in The Zone for the reading. With a court chosen to represent my sitter, we jump through the looking glass from this world and enter the world of the Tarot cards: The sitter, as Significator, becomes part of the reading. So, tell me – do YOU use a Significator or not? I’ve put up a little poll over there on the right hand side of m’blog. Vote if you’ve got the inclination and time! For my personal readings, there are cards that I associate with myself and family/friends, and when they turn up in a reading, I pay careful attention. But I've never tried using a significator in a reading for a client. Don't think I would. Gee, now that you've written up so nice, I may start using them! From a separate deck, of course. And Sharon's point is good. So many of the modern decks have people in the minors and majors that are the primary image, so one could even use them as significators. Joanne – give them a try! And yes, use a different deck – why not? Have you got loads just sitting there desperate to be used?! Now you've got a reason to get another working section organised! I totally agree with you and Sharon – you could use ANY card from the deck as a significator – of course, I'm biased in favour of the Court Cards though lol! I don't use them as yet, but I can see how they would be useful, even just in the act of the querant selecting what best represents them. I think that would get them into a good self focused headspace. If I were to use them I'd definitely use a separate deck, which has the added bonus of really highlighting a position if the card came up in the reading itself. Linette – I hope that you find the coming week's suggestions as to ways to select a significator useful. Using a separate deck gives us a brilliant excuse to buy a deck PURELY for its courts. Any excuse for a new deck, right?! Hi Sharon – good idea, you could use any card as a significator. I would love to hear how your Wands significator week pans out! That's not bad at all Sharon! What card did you choose as your significator? Dear Bonkers – totally luffed that blog post you did on the 3 Wands the other day! I honestly don't know many people who habitually use a significator, but hopefully once the blog us underway a little more, people might be more inclined to use them.